You are here: Home / Social Media Marketing Tips / Facebook Algorithm 2018: What It really Means for Your Business, A MUST READ! What the heck is a Facebook Algorithm and why should you care? Well, glad you asked, the facebook algorithm is the formula that facebook uses to allow your content/posts/images/videos to be seen in the news-feed. Its also a formula that allows content on people’s pages and groups to get into other people’s news-feed. Last week, facebook changed that drated algorithm again. Note that Facebook does this a lot, because they say they want to keep Facebook a Social Platform… the emphasis here being Social! Has the new Facebook Algorithm started the death of Facebook itself? Is this the Facebook Apocalypse? What the heck was he thinking, and so on and so forth… These were some of the reactions in the online space when Mark Zuckerberg announced the new updates rolled out on facebook from last Thursday 12th Jan 2018. To be honest I saw this coming a while back, esp, as I learnt very quickly that there is no point in paying for Page Likes when less than 2% of the people will see your business page content anyway! Because I have got MY EAR to the ground in some seriously FACEBOOK GEEKY Masterminds and developer groups where News hits way before it hits the General public. Okay now that we know I got the dibs…what is NEW? You have heard the news about the latest facebook algorithm changes that are killing your golden egg-laying goose…right? Truth be told, your page was barely getting much attention, like a used and ditched side chick…Facebook wasn’t giving your page much love anymore, in preference for the dollar! For some, your personal profile isn’t doing much better… yes? Yet in some powerfully placed people’s views, this Facebook algorithm update literally hits the business page into oblivion! Others think its just to penalize Business Pages. Yet, what the heck does it mean for you as a Facebooker? How about you who do your live videos via your page? Well, if you hang out with me for the next few minutes, I will help you understand what this Facebook Algorithm update means for you. And How you can KEEP WINNING…Cool? But first…. We didn’t know this resource until 2015, even though it has been around since 2008. When we finally took it up a year later, we still did not get its power until 6 months later. When we finally did understand just how effective this tool is in generating leads and sales for our business, and applied the lessons, we have seen some great results! And checks ? So, if you’re struggling, or simply new and looking to generate more leads and sales. Being part of an amazing community in the online industry being a bonus! We highly recommend this platform, you will thank yourself later! You deserve MORE Success THIS YEAR! I want you to understand that facebook is NOT your platform. Although it is FREE for you to use…Still who sees your content is NOT up to you. All those good friends, former sorority sisters, workmates, ex’s etc. that you invited to be part of your Facebook Journey…Well you no-longer can reach them as effectively via facebook and this has been the case for years now….! Yet today, allow me to show you how you can leverage and hack the Facebook Algorithm this year. You can increase your post reach and engagement, so more people see and connect with you than ever before, if you apply what I share in this training today. 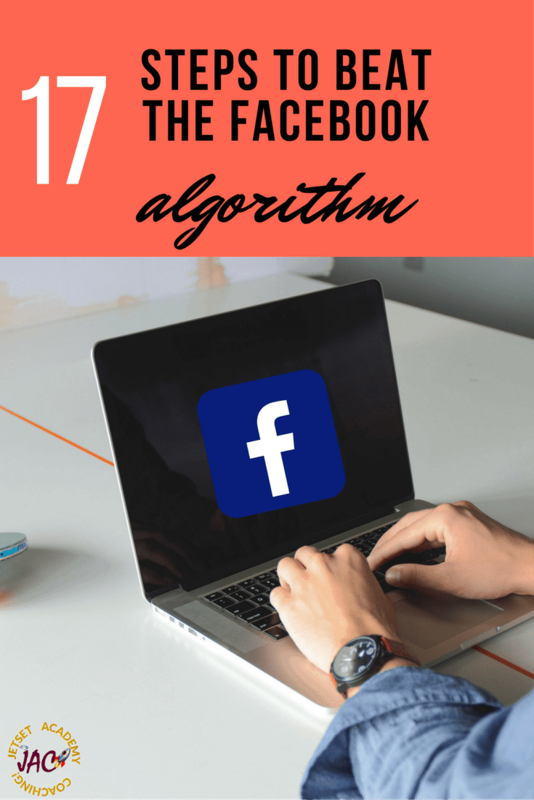 In the video below, I show you 7 of the 19 Tips to help you keep up with the 2018 Facebook Algorithm change and be found. If you intend to leverage Live video, you will also want to Download Your Complimentary Facebook Live Video Hacks. When you build your own list, You OWN that see…kerching… The only way to do this, is if you own your own platform aka Website. And Brand You. You can have a simple page done for you for as little as $200. Or you can have a bespoke, custom made, 5+ Page website/blog or even e-Commerce store done for you for a wee bit more. And we at JWEB Design Solutions would love to help you out with that part of your journey and business. So that you can continue to do what you do best! Now, understand that your Business page visibility is going down even more. Lots of page admins and owners are already feeling the pinch! A ton-load of free organic traffic, has been a thing of the past online for a while! Unless you ADVERTISE or Leverage Pinterest! The reality is, people are annoyed with too many commercial posts in their Newsfeed, so that too is going to be more tight. My advice is if you truly wish to still make a decent ROI on facebook, you need to put some dollar behind your content. Learn how to Run Facebook Ads if yo dont know how. The reality is; running ads is a great way to get clicks to your content. We have been doing this for months. And we took out training with the best and leveraging Facebook Ads since the summer of 2017. So, we put together a resource for you to learn how to do the same, as well as generate leads and make more sales via Social media. You can learn more inside of the Affiliate Jetset Academy. Create content that gets people fired up…Get people commenting, engage them and get them to share, however way you can. Above all Facebook LOVES FB Live! Because they keep people on the platform and that’s what they want. So any entrepreneur or Marketer with half a mind to grow, better be out there doing Lives ON YOUR PERSONAL PROFILE! Strike out by Faith while the iron is Hot! Post less – 2-3 posts MAX a day is plenty, otherwise you are SPAMMING! And be sure to Leave at least 3 hours between posts… Otherwise you are working against yourself and facebook kills off some of your content! There is not enough serve space for all the drama and nonsense people are dropping on FB so its gotta chose what is seen! Meaningful interaction, genuine conversations, that’s what FB is looking to bring back, while allowing more serious Businesses and entrepreneurs to leverage the platform in a more targeted way! Aka Advertise. So y’all always looking on, or over posting for the heck of it like you are CNN or something, FB is noting your lack of engagement or excessive spam and PENALIZING YOU for it…It is a social platform remember that! Warm UP Your Algorithm – 5 mins before you post your content, go to the HOME NEWSFEED, and engage with other people’s content. Comment, answer, emote, share…and then go post your own post…Boom. It will definitely get engagement, because Facebook will expose it to more. DO NOT JUST SCROLL or just like…! Find posts that empower, educate or entertain you and COMMENT! In fact, do this 5 mins before you do your LIVE VIDEO. Go comment on your target audience’s posts. Soon as you start your live, your video will show up in THEIR NEWSFEED, coz you have just been engaging with them. See your video views explode, and soon as you are done the live, respond to some of the comments..this will keep it exposing to even more newsfeeds …Yup my lil secret! So engage, comment, share, click an emoji to show that you are alive and part of the community! ENGAGE! By the way, don’t post things like: “I am going Live in 5 mins.” This will literally kill your Livestream reach…Remember the time between posts? Yup, ditto timing! How about Alerting your audience in the post 3 hours before instead, and send your email list a heads up too! Always Leave a Call to Action – CTA in a Nice Question e.g. “So how’s your week going and how do you think this affects you? Let me know in comment below!” There is no point doing a Live or a value post with no real aim. Facebook Despises External Links – Facebook makes money from You being on Facebook, via Ads. So if you bring in external links, you are sending people off of FB. And so the Algorithm is set to ensure your edge rank drops soon as you add that external URL. Instead of sharing LINKS in your Updates, let your audience know that there is a resource in the comments. Otherwise FB will KILL your post reach. You will barely get anyone seeing it because hey do not want external, commercial related stuff inside of the news-feed! So your blog post posted on your page or even profile, will find very little eyeballs, unless you share the STORY behind the share…Crazy stuff but hey, its their platform and its FREE for us! Use EMOJIS inside of your Post – Yes your post engagement is gonna go Up with use of Emojis inside of your update. Try it, see how that goes for you. We have been testing it out and it works! Early Engagement Score – you dont see it, but Facebook is calculating it. The more likes and comments you get withing the first 15 mins of your post. This will set the engagement for the rest of the day. So when you post, make sure that you are there to engage with your post, Like your post, respond to anyone who engages…! If even only one person likes it, go engage with them e.g. Such a comment alone will re-open the door for your post to be shown to more people. If your Friends list is Maxed out, and they are not engaging, FB thinks you are a spammer…See they know nobody really has 5000 real friends! So, don’t add more than 5 friends a day, unless you are holding some cool conversations with them, Seriously. DO NOT GO ADDING 30 people to your list, unless you know they are gonna truly engage. When you add people, delete those who are no-loner serving your goals in equal numbers. In fact, if you are maxed out or have more than 3000 Facebook Friends, go Delete people from your list who are NOT truly welcome to your table of life, Until you hit 3000…Maintain that number! Hold more INBOX conversations esp. with new people and those you haven’t chatted with in ages. If they dont respond…UNFRIEND them! Unfriend people who ARE NOT ENGAGING with you. People you added because they were prospects, these people are now affecting your reach and rank on facebook. Lack of activity IN YOUR INBOX is Killing your reach! – Your biggest activity on Facebook should be in Messenger! Seriously. So, as soon as you make a new friend, go into their inbox and say thanks for the friend request. Have a conversation, end that chat with A QUESTION. That should trigger a response from them and that will help your rank on FB! If that person doesn’t answer you, then they affect your facebook rank and the facebook algorithm is marking you down. You will be considered a “Spammer,” even if they are the ones that sent you a request! Okay, what else? Well, you will soon see “Group Ads”…YES I have seen a couple so that’s being rolled out too…! You either win and become one of the success stories from this Facebook update, or you let it get to you and, it becomes your #FBApocalypse…Whatever you decide…You are Right! Facebook will keep changing the algorithm because they can. Your small biz page will not be losing much from this change. It wasn’t GAINING MUCH before. Now you have to do What you should have been doing already…Create Great Content that people want to See in their news-feed and share to their tribe too. To do this, simply head on to Google trends and see whats getting people talking and Well create your own take on it and you will be fine…No links if you can help it! Affiliate JetSet Academy – If you are in any kind of sales or Online Marketing activity, you need a proven Formula, strategy and resources! You want to set your Brand up online or even offline for success using Social media to deliver the customers, business partners and even team members. How would you like to increase your revenue to 2-5 weekly sales and hit your first or next 10K online in 90 days or less? If you could increase your ability to make more sales in your business would you like to take a look at the formula? The 4-C Formula is something that increased our ability to make more sales to over 69% and I show you in this simple formula exactly how to do it. If you have a product or service that you’re promoting you need to Check This Out. FB algorithm doesn’t show up boring stories. So if we post a story that does not score well, nobody can find it in their news feed. That’s not really good. Many of these tips are very interesting. I especially felt that the emoji idea is the most fascinating. these hacks are perfect. the tactics you have shown to leverage and hack the Facebook Algorithm are very helpful and I am going to watch the video as well. Enjoy the Video Andy and glad you got value! 🙂 Go get em bro! Julie, this probably affects us all and we appreciate your study and expertise. I think we should feature this post on our next Blogger’s Pit Stop for more to see. Thanks for all your hard work and helpful attitude. Glad more people will benefit form the insights and Tips 🙂 Love the Pit Stop! With this new algorithm update, expect to see more organic content from people but less from businesses & brands this 2018. Exactly and I like that Jelena. Only thing Is How do they intend to serve their Business partners? Have the FB share holders agreed to take less of the dividend 2018? Thank you for sharing this very informative and resourceful article. I have yet to proceed with FB ads as of yet, but maybe soon. You are most welcome. If you are running a business of any sort, advertising is essential! 🙂 It may or may not be FB Ads. You decide! I honestly gave up on Facebook a long time ago. I post daily, but my interaction isn’t nearly as great as the other social sites! I hope someone can find this beneficial! This was SO helpful! I keep seeing all these things we have to do… but without actual info! I bookmarked this page and will get back to it soon as I get home. I need to level up my Facebook tactics. It is another uphill climb! Glad you got value and enjoy the new Facebook! This was a really informative post! I recently created a Facebook page for my blog so will definitely be keeping this post in mind. Facebook has been pretty annoying lately. I hope this gets stuff back on track. Really great post and super helpful. I find it helps my page if post a few times a day. Some of your tips are so easy to implement. I’m going to start with the five minutes before posting, engage with others first. It totally makes sense to not spam your readers. Happy to serve Heather, and also Its easy to Visit 5 people you havent engaged with daily and just let em know you still exist, awaken your FB List…Its your cash cow as GiGi says! Great information. I personally like the changes to the algorithm but probably because I never really figured out the old ways. Engagement and dialogue have always worked best for me anyways. The one thing I didn’t know was the focus on FB live. Not quite there yet but maybe someday. Keep being social and serving your audience, and sooner rather than later, get on the Live wagon, some day dont exist on any calendar right? 🙂 Thanks for stopping by! One second I feel like FB is dying and the next I feel like it’s a cash-cow for blog growth! hahaha! I do get a lot of traffic from FB but it’s mostly from the FB groups! I don’t think my actual page brings all that much traffic to me. Some really great tips here, thanks! Big thanks for sharing these information, Julie! Great resource, and definitely gold for people like us who use Facebook for business. I am happy to serve and keep our friends and community informed! 🙂 Feel free to share with others. Nice one. I hadn’t gone into details of this earlier. I like your point on warming up with the content and engaging on other’s posts too. Cheers!! I love reading about something that can help me with my business. Glad I found this and I have learned a lot. Now I just make 2-3 posts per day. Facebook has changed it’s algorithm so much in the past year that it’s overwhelming! Thanks for the update on the new changes! Wow I didn’t realize the whole link issue and having it not show up in posts because its an external link thing. I need to learn a lot clearly. This was helpful, I don’t understand anything about how the algorithm on facebook works, so this really will come in handy. As explained in the start it really is about reach, engagement, being social! Enjoy it for it will be a different place 5 years from now! Thats why I also leverage Pinterest! Love the video! Seeing her live gave me a much different thought on who she is. I joined Facebook to be like everyone else, everyone had one it seemed in 2011. Great ideas and suggestions! Thanks for sharing and Here is to The Log life of Facebook, a Platform that has come to change lives for many of us! I’ve been wondering a lot about this in the recent months, particularly the recent weeks as I noticed a bit of stagnation in my interaction across my (Facebook-owned) social media platforms. It’s super annoying, and I’m not liking the change in their algorithms. I’m glad this helped me understand it all a little bit better, though. Yes, FB is Glitchy and buggy at the moment because they are rolling ut the chnages Mentioned in this post and more. The worst hit area is the FB Ads Space…you cannot believe whats going on there…Fingers crossed it all gets fixed, and he changes settle in faster. I hope so, too! It needs to be fair and smooth-running for all of the people who use these platforms as a way to support their businesses (especially the small companies who are trying to build their audiences). Hey Emily, It was created as a “Social media” so business comes secondary today according to Mark Zuckerberg! So be careful what you post and how you do it or your business! Thanks for educating us about how the algorithm works. Thanks for sharing. I will definitely bookmark and come back to this. Happy to serve and I am glad you got value Adewale 🙂 Enjoy! Thanks for writing this article. I’m looking to smash FB Ads this year and this article will help me tons! Just wanted to get your opinion on something – I was just reading this review of the FB Ads Essential course over at facebookadsmadeeasy.co.uk/2017/12/01/my-facebook-ads-essential-review-heres-what-i-really-think/ and the guy reviewing this course mentions how this FB Ads Essential helped his someone’s business grow by 350% which I thought was a little bizarre. Would love to know what you think about it and what you think about the course in review..are you familiar with it? Thanks! Can’t wait to hear your reply! #1. The reality is every marketer with a product wants you to buy their course. And Anything Older than 3 months TODAY about Facebook Ads is OUT of sync. Unless the course owner offers some kind of Monthly Call or Updating system. #2. If I was looking for expert training on FB Ads I actually find it on FACEBOOK! Which is HOW we found our mentor last year and thus Can with Confidence Teach our Clients how to leverage FB and create Ads that Convert. #3. As an Entrepreneur I appreciate how much it costs to create a program. So Without access to the training Ibrahim, I could not in all honesty Judge the course you shared and give you a review of it. It is indeed possible to get a huge ROI with LONG TERM Ads and a Fairly Good Ads Budget! No one gets that kind of ROI if they dont commit to long term Advertising. We are happy to serve you and help you create FB Ads that Convert if you care to chat. [ Smiles ] Facebook is always changing their algorithm. Business-related bloggers would benefit more by using Pinterest and Twitter.